Free and charitable clinics and networks are not-for-profit, community-based and faith-based organizations that provide healthcare services at little or no charge to low-income, uninsured and underserved individuals, while relying heavily on volunteer healthcare professionals and community partnerships. 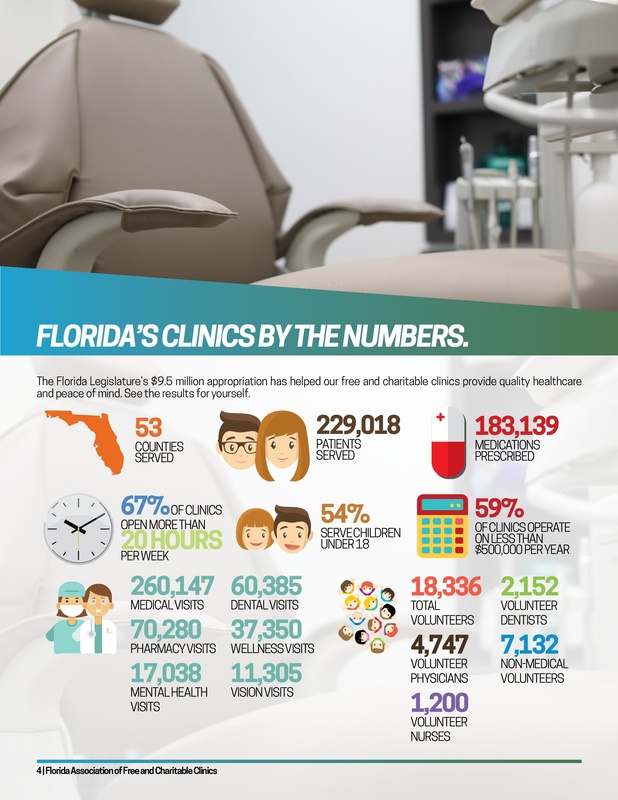 Florida has more than 100 free and charitable clinics and networks, most of any state. The Florida Association of Free and Charitable Clinics (FAFCC), a not-for-profit 501c3 organization currently headquartered in Miami, represents and supports Florida’s free and charitable clinics and networks through public policy advocacy, funding and resource development, knowledge exchange, data collection and research, and marketing. Even with the Affordable Care Act (Obamacare) in place free and charitable clinics continue to play a critical part of the healthcare safety net. Currently, Florida has chosen to not expand its Medicaid program (or implement an alternative), but in the event the state chose to move forward a study by the Urban Institute indicated there would still be approximately 1.7 million uninsured residents.